[Note: This reading was unavoidably cancelled due to weather. The readers have been rescheduled for future dates.] The first odd sundays of 2018 takes place at 2 PM of January 7 at Corked Wine Bar, 83 Regent St. Doors open at 1:30. 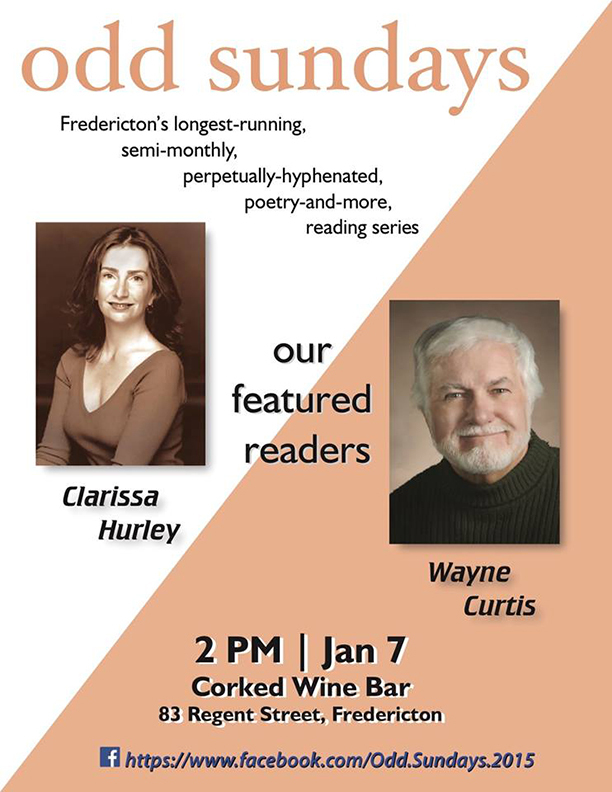 Wayne Curtis and Clarissa Hurley are the featured readers, and as always, there will be an open mic and a book draw. Wayne Curtis majored in English at St. Thomas University. He is a winner of the Richards Award for short fiction as well as the CBC Drama Award and the Canada Council of The Arts. 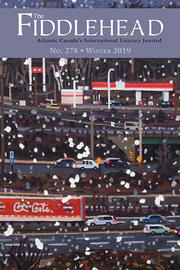 Wayne has contributed to a number of publications, including The Globe and Mail, Quill and Quire, Outdoor Canada, and The Atlantic Salmon Journal. His stories have appeared in The Antigonish Review, The Fiddlehead, Pottersfield Portfolio, among others. In 2005 he received an Honorary Degree of Letters from St. Thomas, and in 2014 The Order of New Brunswick. Wayne currently divides his time between his cabin on the Miramichi River and Fredericton. Clarissa Hurley is an award-winning actor and playwright, as well as a director and dramaturge. Following her MA in English at UNB, she trained at the Royal Academy of Dramatic Art, the American Academy of Dramatic Arts and U of T’s Centre for Drama, Theatre and Performance Studies. She has been a director of the NotaBle Acts Theatre Company in Fredericton for the past eight years. Formerly a freelance journalist, she has published fiction, and a wide range of articles. Clarissa edits fiction for The Fiddlehead.